Inter are reportedly set to meet with Cagliari to press ahead with plans to sign Nicolo Barella, who had been linked with a move to Chelsea. The 21-year-old has emerged as one of the top young talents in Serie A, making 22 appearances for the Sardinian outfit so far this season to form a key part of their midfield. His club form has even now led to four caps for Italy which suggests that he will have a bright future for club and country, but he is being tipped to begin a new chapter in his career later this year. As noted by the Metro, it had been suggested earlier this month that Chelsea were in pole position to sign the midfield ace with a deal said to be in place. However, the Italian international has gradually edged further and further away from moving to Stamford Bridge, with Inter now seemingly on the verge of securing a swoop with Calciomercato noting that they will meet with Cagliari officials again imminently to discuss a deal for the €50m-rated starlet. 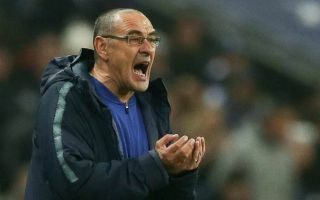 That would suggest that Blues boss Maurizio Sarri may have to start considering alternatives to bolster his midfield, with Cesc Fabregas leaving the club this month while Mateo Kovacic’s loan spell from Real Madrid will end in the summer. With that in mind, it could leave Chelsea dangerously light in midfield, and coupled with question marks being raised over Jorginho’s recent form, it might emerge as a real problem area for the Italian tactician. Based on the report above, it would appear as though Inter are the likely destination for Barella if an agreement can be reached, with the chances of a switch to the Premier League and Chelsea slowly dissipating.